Jonas and Iris are a couple from Belgium. 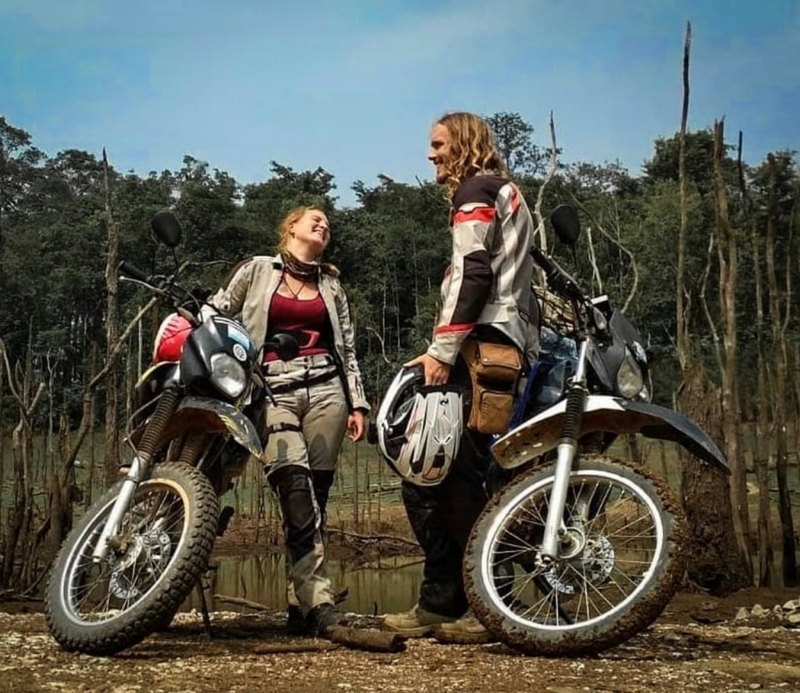 I discovered their travels, like many other people I have interviewed for this series, by appreciating their adventure motorcycling travel pics on Instagram. You can follow their journey to many locations around the world at @a.travellers.tale. 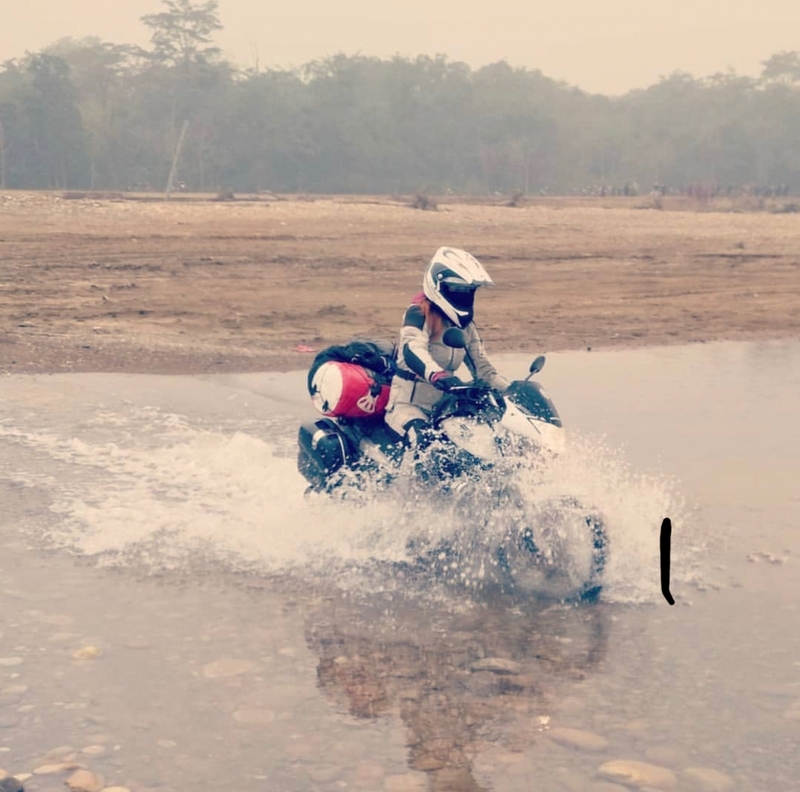 They are dedicated motorcyclist who travel regularly and I am always an admirer of people who prioritize adventure in their lives. 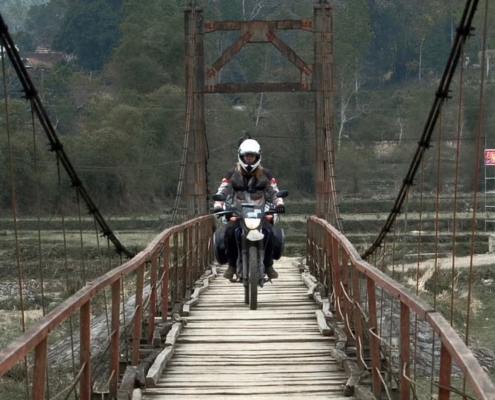 They travel on a variety of bikes and to a variety of geographic destinations. To get a better sense of who Iris is, you can head to her blog A Travellers Tale for updates on their trips and much more. I am excited to share this interview because it has a bit of a different flavor than most of the others I have done. 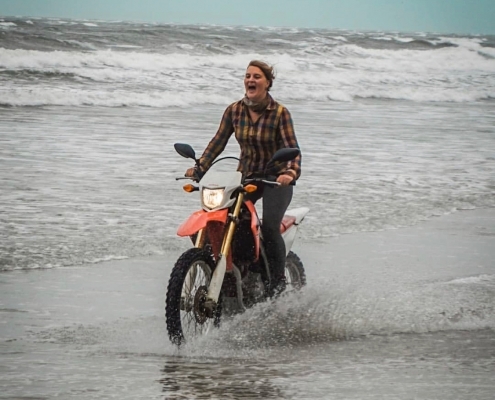 While many interviews I have published over the years are a story about a persons specific trip or life choice to try to continuously ride, this interview is more of a dedication to living a life that doesn’t have such a clean description. It is about people who simply love to travel by bike. Check out their photos below and enjoy the interview. Currently we are back in Belgium. Jonas is working at RAD, a shop selling about everything related to motorbikes while Iris is working at Sciensano and INRA looking how the big food companies influence daily life. The long-term plan is to become our own boss working with motorbikes, photography and writing. Tell me about your (Year, Make, model) bike’s. What do you call them? We own 4 bikes. The bike we both learned to ride on, a little Yamaha Virago 250 from 1994, a Kawasaki Versys 650, a BMW r850gs, also sometimes called bumble bee bike after one of the bikes we rode on our journey through Asia. 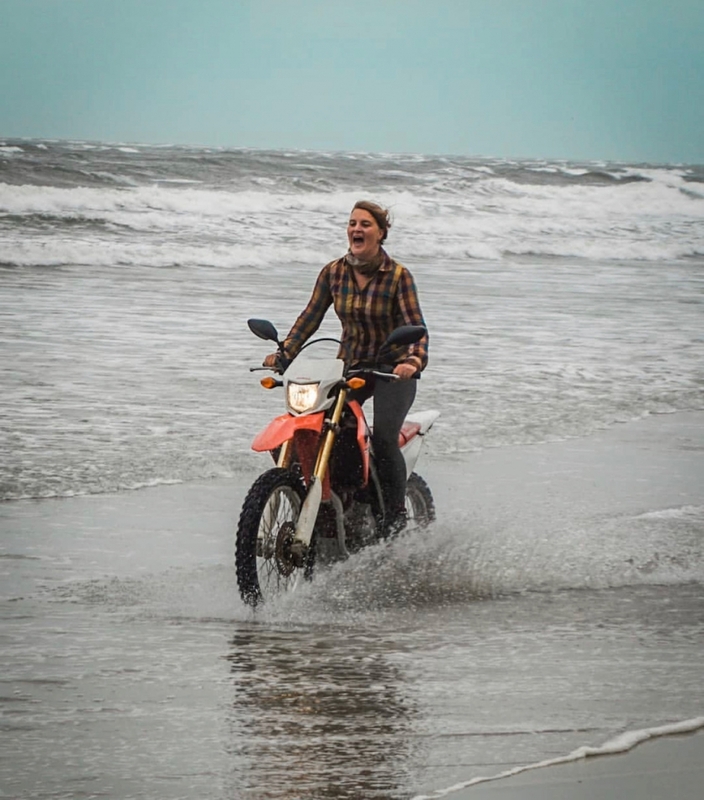 Last but not least, we also own a Suzuki DRZ400 and are still on the lookout for a friend to accompany it on some off-road adventures. 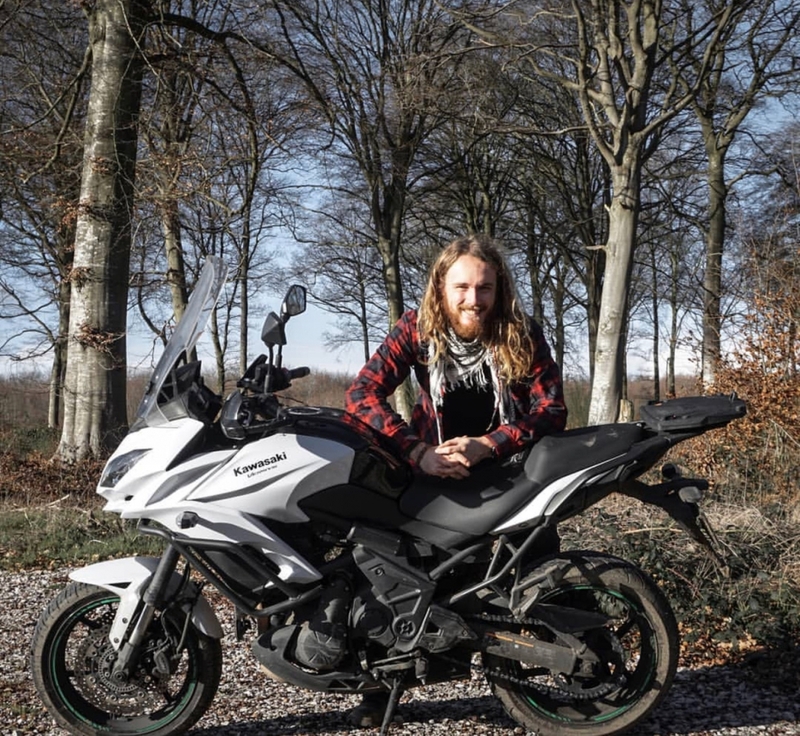 The Versys 650 belongs to Jonas and is his best friend on the road accompanying him on a daily basis, even on grumpy and rainy days. The r850gs is Iris her bike. A 20 year old machine, but still going strong carrying her through storms, muddy tracks and along curvy roads. It’s the only bike that has the honour not to have been dropped by her yet. When and how did you get them? Back in 2015 we got the Virago before either one of us had a license. It was in bad shape, but we used it to practice our riding in the garden. 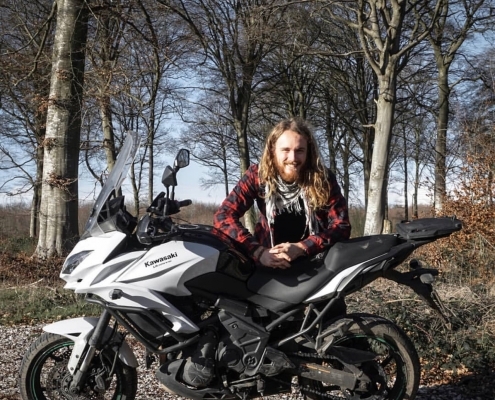 Once Jonas got his license back in 2016 he got the Kawasaki Versys 650 because it seemed to be the best bike for your buck if you need a commuter bike. When Iris obtained her license in 2017, Jonas fixed up the Virago and it became her companion for her first 3000 kilometres on the road. Then we left making our way through Asia buying and selling motorbikes while we went along. 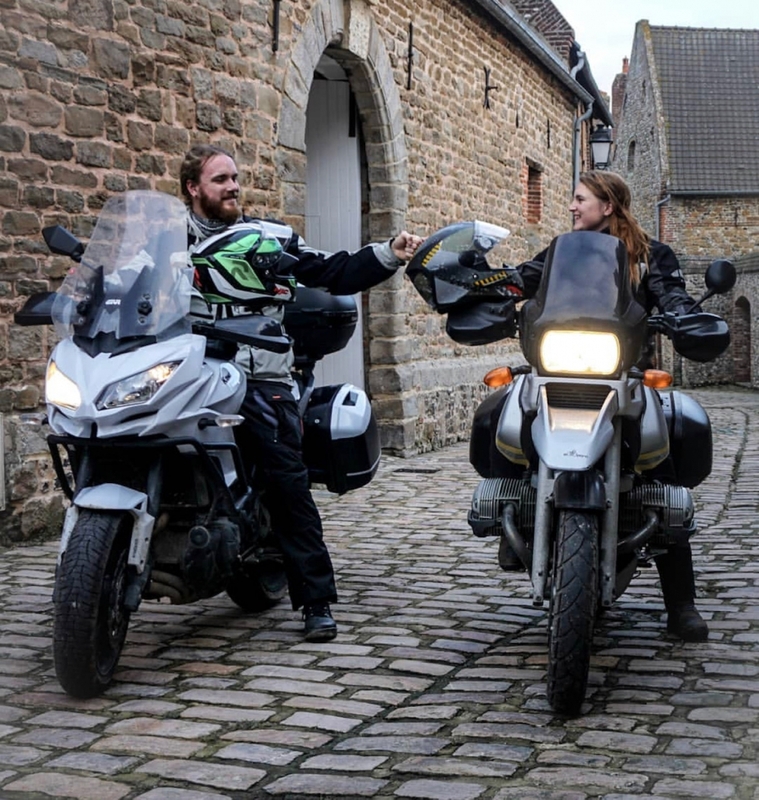 After ending up back home after a year on the road Iris was lucky enough to buy her BMW r850gs second-hand from a friend. The Suzuki DRZ400 just became part of the family a week ago and is still eagerly awaiting its insurance. As we started riding as students the main factor determining our choice was budget. As our bikes are our only means of transport wherever we go they had to be pretty good all round bikes. Honestly, we dream of having a XT660Z Tenere, an Africa Twin, a gp450 and…., but for the moment we are mainly discussing which bikes we will buy to ride around the world in a couple of years. The DRZ400 is already a strong competitor for sure! Nothing apart from adding crash bars, handguards and fog lights to the Versys and the BMW. The DRZ400 is gonna be a different story! What is your favorite part about it, living off of your bike? The unbelievable sense of freedom and being able to live solely in the here and now. Even though it can be tiring and some days you spend more than 12 hours on your bike, you never feel stress the way you do at home. You just live for the joy of living. Hmmmm… Ask that again in a few years? Maybe we’ll find an answer by then. Now the first things that comes to mind is the lack of a good hot shower and a comfy place to sit down in the evening. What is the best place you have taken it? Favorite road you’ve driven? 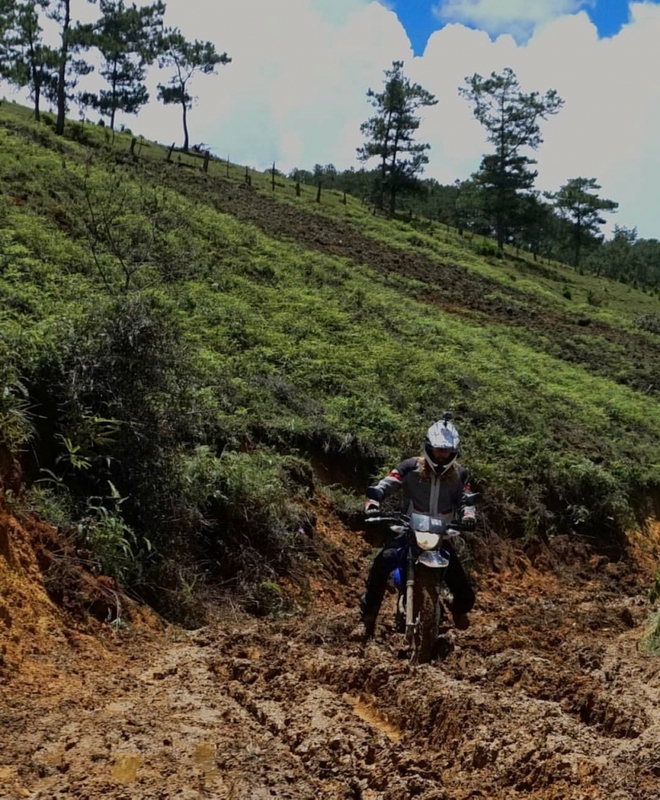 It would be a competition between an unfinished road somewhere in Karnataka, India, and a track somewhere in the North of Laos. We ended up riding both nameless roads by chance and a little getting lost. If you could give a person one piece of advice when thinking about living off a bike, what would you tell them? Go for it! The first days, maybe even the first month can be scary and bewilderingly unreal, but there’s nothing more beautiful than being able to live each day fully without having to worry about those to come. We both grew up within a travelling spirit. Our parents took us on adventures from the moment we were born. At the age of 15 and 17 we went to India on our own for the first time and after that we just kept on going. Discovering the world hitchhiking, trekking and biking along. Respect, curiosity to discover the world we live in and the ability to be self-reliant. Probably a little of both. 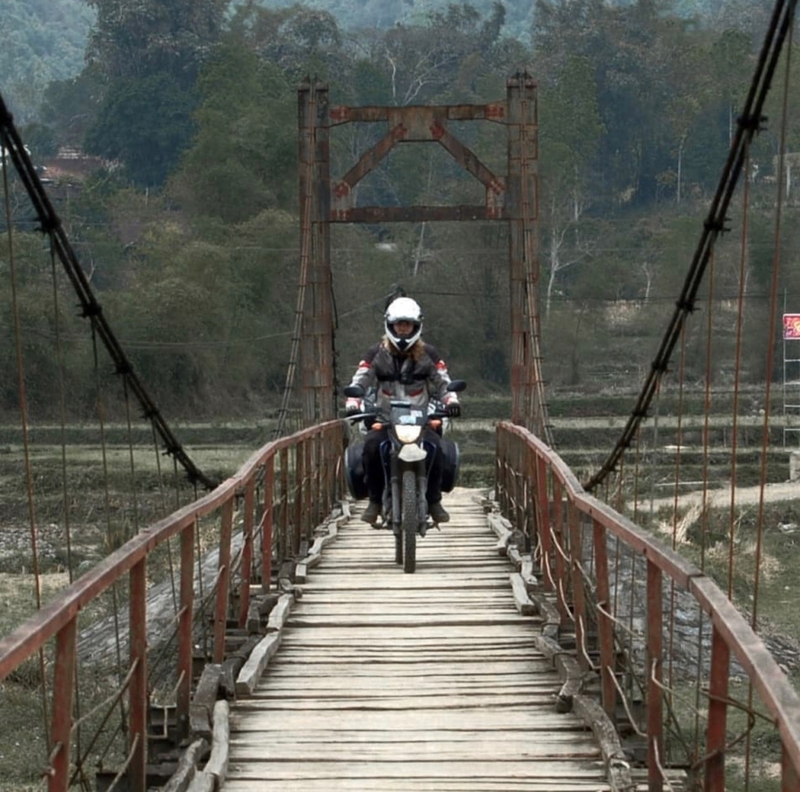 We’ve always thought of doing something like travelling the world on a motorbike so it wasn’t a new thing. When it comes to it though it still feels like taking a leap of faith. You have to cancel your job, end your rental agreement and so on and so forth! Luckily, we learnt being on the road that, whatever happens everything always falls into place. It’s when you least expect it that the most beautiful things start happening! All that aside, getting back is bit of a challenge. You feel free as a bird to come back to society that only wants you to spend your waking hours working and shopping! Knowing that we’re going on another adventure makes more then up for it! Our next big step it to hit the road and ride around the world without looking back. No time limit, no boundaries and no obligations. Our biggest ambition is to go through life happy, knowing we won’t regret the steps we take. These two things determine our careers and the life we choose to live. We save money, invest in motorbikes and try to own as little as possible. You never remember how buying clothes makes you feel, but the feeling of an endless road ahead is one that sticks forever.